For a Srivaishnavaite, Kainkaryam is essential; Selfless and unconditional „kainkarya‟ cleanses the soul of the performer. One must adore and be attached to their Acharyan and only the direction of Acharyar will lift us from all earthly evils. ~ and everyday we must think of our Greatest Acharyar – Periya Jeeyar - Saint Vara Vara Muni, the last of the ‘Poorvacharyars’ in the grand galaxy of preceptors, known as Alagiya Manavala Nayanar, before he was ordained the holy order of Sanyasa. It is none other than our most adored Acharyar “Swami Manavala Mamunigal” - the reincarnation of Sri Ramanuja who was himself an incarnation of Adisesha. It will be too rudimentary to write of the details of our Swami Maamunigal - known as ‘Yathindra Pravanar’ arising out of his irresistible attachment to the lotus feet of Sri Ramanujar known as ‘Yatheendrar’. Sri Manavala Mamunigal was born in Alwar Thirunagari, Tamilnadu in AD 1370. At birth he was known as ‘Azhagiya Manavala Perumal Nayanaar’. Later he was hailed in very many names such as ‘Yatheendra Pravanar’, Ramyajamathru, Saumyajamatru, Visada-Vak-Sikhamani Varayogi, varavaramuni. He lived for 73 years on this earth performing many Kaimkaryams at Sri Rangam and undertook many pilgrimages to many Sri Vaishnava Divyadesams. Of the many works, ‘Upadesa Rathinamalai’ is one which all of us should know and recite regularly. 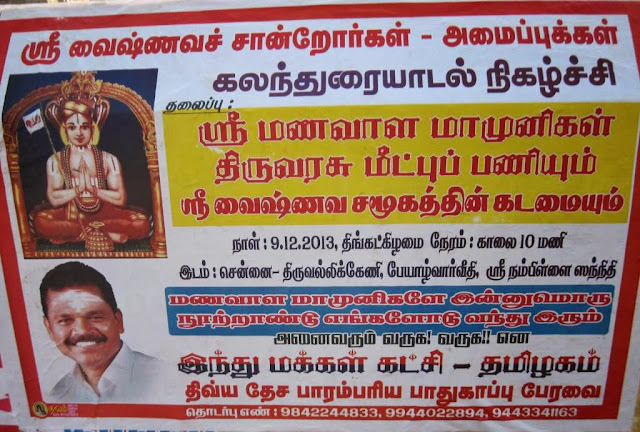 There are 73 paasurams + thanian given by Kovil Kandadai annan and another one to complete rendered by Erumbiappa. Upadesa Rathina Malai is a legendary work which provide complete details of month of the birth of Azhwars, the constellation in ascendance at the time of birth , the avathAra sthalams and the unique glories of each of them. The Jeeyar who established our Thennacharya Sampradhayam believed and practised the tenet of following the words of early Acharyars as they are [munnor mozhintha murai thappamal kettu]. Mamunigal’s commentaries are characterised by great clearness and completeness of exposition. He had 8 famous disciples known as Ashtadig Gajas who were to take over the mantle and spread Sampradhayam for posterity. More than hailing the greatness of our Acharyar, there is some tinge of sadness to this post…. For sure, ‘Thiruvarasu’ is not any ordinary structure …… it is embodiment of our Acharyar and we need to transform it and restore to be the place where all Sri Vaishnavaites will rededicate to the cause of Sri Vaishnavism – doing kainkaryam to the Lord and to his devotees. Thiruvarasu should be nerve cente for realization of our glorious Acharyar’s ideals – preaching and practicing what He taught us. If we ponder - we realise having lost many things……… and mostly all these are due to our generations not properly adhering to the customs and rituals prescribed to our Sampradhayam by our elders and our Acharyars ~ there is no purpose blaming outsiders for the mess. At least from now, let us try to live our lives as pious Sri Vaishnavaites – ever singing the glory of Sriman Narayana, practicing our sampradhayam and preaching the glory of our Emperuman, Emperumanaar and other Acharyars. Let us learn our treasure of Divyaprabandham and other Grandhams – and ensure that our children also learn these and do not get away from the mainstream. We must go to temple daily – support our sampradhaya activities. We must visit Divyadesams and all other important places associated with our Acharyars and ensure that they are maintained properly and in this ….. we have to support – those who have been wedded to the ideals of our sampradhayam and maintaining our culture by doing yeoman service to Lord and to our culture, foregoing earthly material benefits for which many of us crave. Let us unite and be united all the time – with ill-will / hatred towards none …. and devotion to Acharyas and Sriman Narayana. 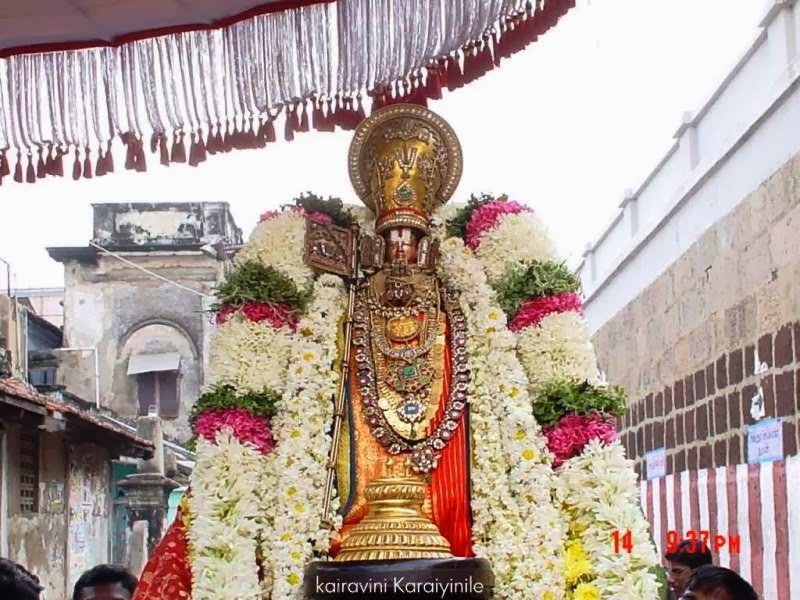 Azhwar, Emperumanaar, Jeeyar Thiruvadigale Saranam. Sri Manavala Mamunigale – innum pala noorrandu irum..